The monastic life is a tough choice to make. But more and more Chinese are finding alternative ways to keep themselves temporarily away from worldly distractions and find a moment of real peace. 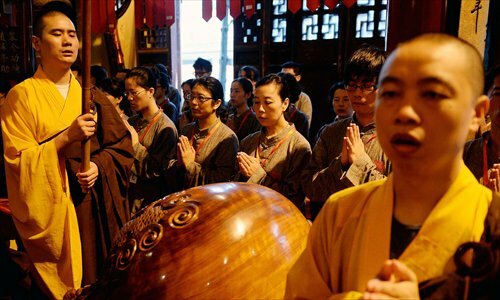 At the Yufo Temple, a Buddhist center in Shanghai, 70 people, mostly office workers, recently signed up for a two-day meditation course, during which they slept in the temple, chanted with monks in the morning, received teaching in Buddhist meditation, and meditated. They also bid farewell to their mobile phones and computers, and ate vegetarian meals with the monks. 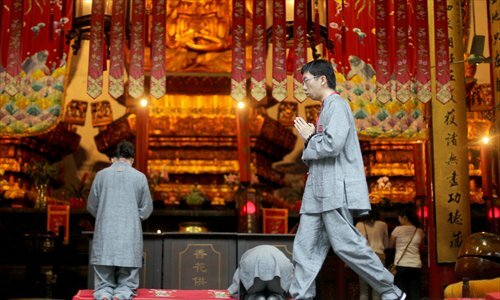 This is the first time that the temple, one of Shanghai's most prestigious Buddhist sites, has launched a meditation course that is open to the public. 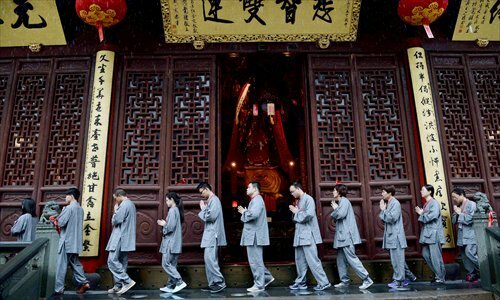 According to Master Jue Xing, the abbot, the decision was made to meet the growing demand from urban dwellers to pursue inner peace, and to offer a different experience to Shanghai's buzzing city life and frenetic pace. The course attracted over 500 people just four days after it was open for registration. The temple said it will launch three-day and week-long programs in the future to meet the great demand.